I’ve learned a lot about the economy since the Donella Meadows Institute launched its Sustainable Economies program earlier this year. I’ve learned about problems with fractional reserve banking and our traditional economic model, and I’ve learned about alternatives like public banks, complementary currencies, and cooperative ownership models. But perhaps the piece of knowledge that surprised me most of all was learning just how much I didn’t know about our economic system. Despite taking economics courses in college, keeping up with the news, and managing my own finances, I discovered that the inner workings of our financial system were sometimes a mystery to me. Luckily, there is a huge wealth of information out there. The internet is filled with resources that explain how our current economy works and how it might work better. I’ve collected some of these resources below as a starter guide for interested folks. If you find yourself unsure about exactly what happens to your money once you’ve deposited it in the bank, these resources are for you. If you want an alternative to high interest costs that are built into every purchase you make, these resources are for you. Dive on in! Positive Money is a not-for-profit organization that works to raise awareness of the connections between our current monetary system and some of the biggest social, economic and environmental challenges facing us today. As part of this mission, they have created a number of excellent educational videos, including some that focus on how our banking system really works. These videos are a great place to start, since they take a step-by-step look at how the system functions. View the first in this series below, and then visit their website to watch the rest. Released earlier this month, this book by Rob Dietz and Dan O’Neill takes a look at the problems inherent in our growth-dependent economic system. They explain why growth shouldn’t be—and, ultimately, cannot be—our prime economic goal, and then move on to explore more viable economic structures. 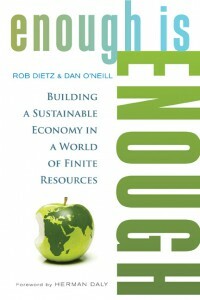 Enough is Enough is a great read for those interested in a blueprint for building a sustainable economy that can meet human needs. On February 1, environmental leader James Gustave Speth and ecological economist Rob Dietz will team up to discuss the breakdowns in our political and economic systems—and how we can take action to fix them. Join in the discussion and learn what you can do to mend the system by taking part in this free Web Chat. As the Caring Economy Campaign notes on their website, “We are not accustomed to seeing economy and caring in the same sentence. Nor have we been taught to think of economics from the perspective of caring for people or nature.” If we want an economic system that meets our needs, these things will have to change. To that end, the Caring Economy Campaign is offering free lunchtime webinars to engage participants in the possibilities of economic and cultural transformation. Join them to learn about possibilities for more sustainable and humane economic systems. Once you have gained an understanding of the issues with our current financial system and learned about some alternatives available to us, New Dream’s website is a great resource. The videos in their library focus on helping you implement alternatives such as time banks, clothing swaps, sharing circles, and energy co-ops in your own community. Watch this video about their vision for a Plenitude Economy below, and then check out their other videos to start building it! Do you have other favorite resources you’d like to see on this list? Please share them with us in the comments section below!